The exterior of McIntyre’s home. 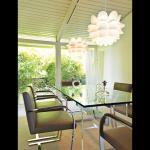 (1)	The chairs in the dining room are by Mies van der Rohe; the lights are from Ikea. 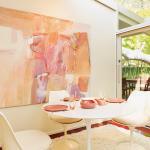 Saarinen “Tulip” chairs and table, set with Russel Wright ceramics. 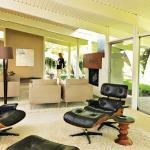 Eames lounge chairs in the living room; the mannequin was brought to the house as a party prop. 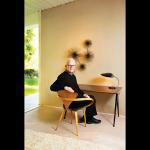 Tom McIntyre in a Cherner chair. Tom McIntyre is a serious collector of cars in a city that’s serious about its automobiles. But just as impressive as the Corvettes and Porsches is McIntyre’s trove of midcentury-modern furniture, a testament to how much the Valley native prefers living like it’s 1959. For his first home the car buff purchased a nondescript 1950s house, but its lack of architectural flair didn’t stop him from decorating with period pieces like the Heywood-Wakefield bedroom set from the now-defunct antiques store Piccolo Pete’s. Soon he’d acquired such master works as pristine Eames lounge chairs and a Jean Prouvé table, Arne Jacobsen “Egg” chairs and a Greta Grossman lamp. 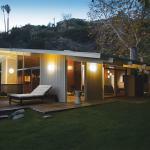 But they didn’t have a truly proper setting until he happened upon a 1958 William Duquette house in Glendale, a modernist classic that was unsullied. That its architect also designed Riverside International Raceway added a karmic note for McIntyre, whose Burbank company manufactures auto emblems. He became the home’s third owner in 2006. What resonates with McIntyre is how midcentury design embraced the bold new atomic age while “giving it an air of sophistication,” he says. 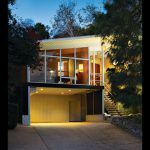 This elegance is apparent at the Glendale house, where the slanted tongue-and-groove ceiling blends seamlessly into glass walls that look onto a green glade of grass and ferns. Skylights frame sculptural sycamore branches that loom overhead. To the right of the entry—paneled in lush fiddleback mahogany—is a long open space with a cast-concrete fireplace encircled by glass so that it appears to float in space. 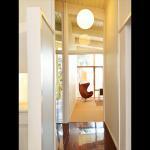 Eames chairs and side tables form a conversation area. Along one wall a George Nelson shelving unit holds a mix of precious items: Eva Zeisel ceramics, a “Dog Lamp” by Jean Boris Lacroix. 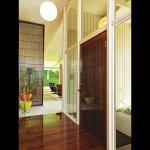 In a few places the midcentury furniture has been supplemented with contemporary pieces. McIntyre loves that visitors assume the lights in the dining room, which boasts Ludwig Mies van der Rohe chairs and Dorothy Thorpe glass candleholders, are some midcentury find. They’re from Ikea, he says, laughing. Next articleL.A. by the Slice: What’s Now Housed in That Formerly Decrepit Movie Theater?